…but, trust me, the pictures don’t do him justice. 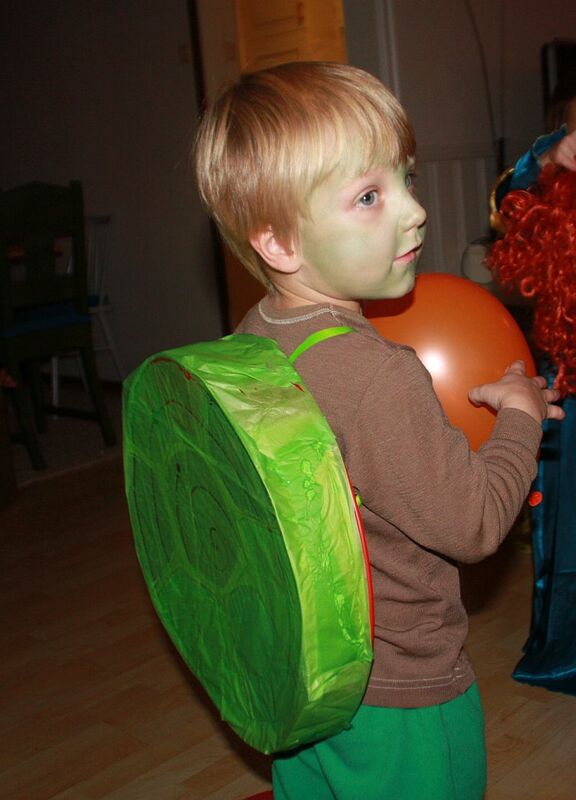 This was the cutest Halloween turtle ever. Our friends and neighbors invited us to their annual Halloween party last weekend. I have a little bit of guilt about Halloween. It’s an up-and-coming holiday around here, with more and more kids out trick-or-treating etc. One American friend of ours hosts a very cool, all-out Halloween party for her kids’ classmates, complete with a haunted house and games and imported candy. This year I didn’t even manage to get a pumpkin carved. My guys are a bit too young to care, and I’m a bit too un-energetic lately to single-handedly make it happen. So anyway, to me, Halloween = work, and we all know how I feel about more work. Insert sigh of relief. From two humps down to one. A turtle I could handle. Incidentally, while Emil really is into drawing (or having us draw things — lately he wants us to draw people he knows, which, um challenges our artistic abilities), Karel has very limited interest in all things crafty. Every once in a while I’ll try to be a good mom and initiate a craft project, just to be the only one who finishes it. So while I had a vision of us working on this costume together, I was very well aware that that was more of a delusion than anything. Anyway, we cut, colored, and pasted and magically had a turtle shell. He was so excited about green face paint that he was giggling while I put it on. 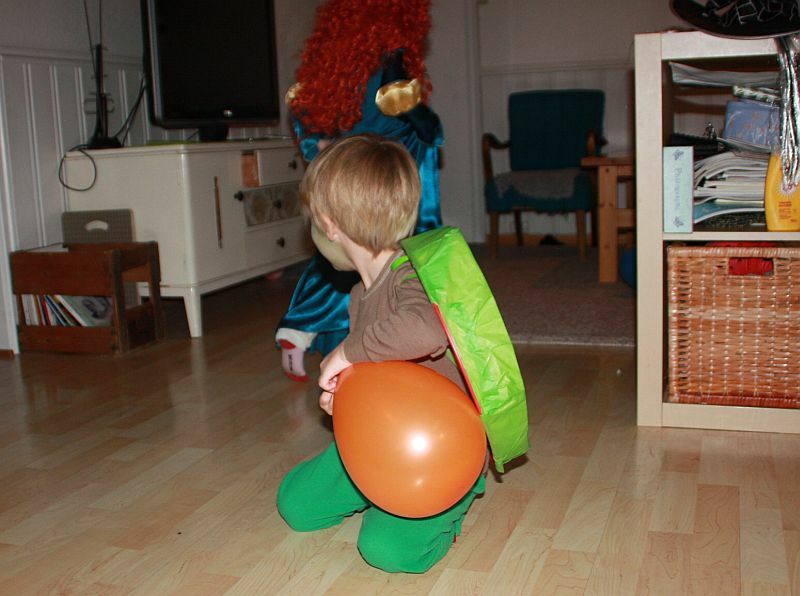 As it turned out, dressing up as a turtle was a pretty good choice for our first-born. He wasn’t well acquainted with some of the other kids at the party, so played the part and crouched under his shell, observing. While out trick-or-treating, he occasionally lagged behind which just looked really appropriate — Pokemon, princess, and witch, with a contemplative tortoise following ten steps behind. Anyway, the kids were excited to be out and Karel was over the moon about all his candy. (”Mama, I am super-duper happy about all my candy!”) I was explaining to the other moms about how it is in the States — how the candy has to be individually wrapped, etc., etc. One man didn’t have any candy so he distributed bananas. We can’t give out fruit any more, can we? He can rest assured that the bananas were eaten, and the remaining candy is in a bowl on top of the fridge, where it could possible remain for eternity. 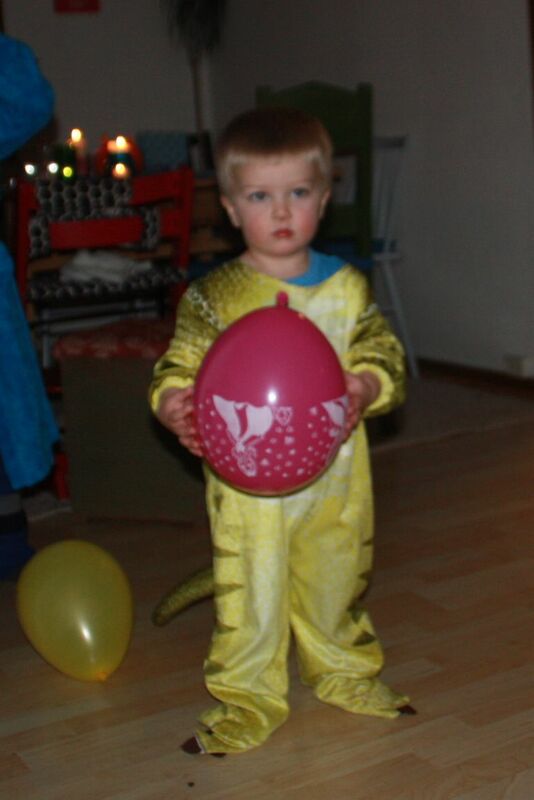 Emil wore the dinosaur costume we inherited from the Ramseys, and it seemed to suit him well. He didn’t join in trick-or-treating, but I think being around the big kids and playing with balloons pretty much made his night. I accepted the oohs and ahs of ”you made that turtle shell yourself?? This morning? Using a berry-sorter?” WITHOUT bringing to attention the fact that that was the ONLY costume I had made, as Bjørn and I were the only adults not in costume, and Emil’s was pulled from a hanger in the closet. There are some weeks you just don’t look gift-praise in the mouth. We did it! We managed to reunite! 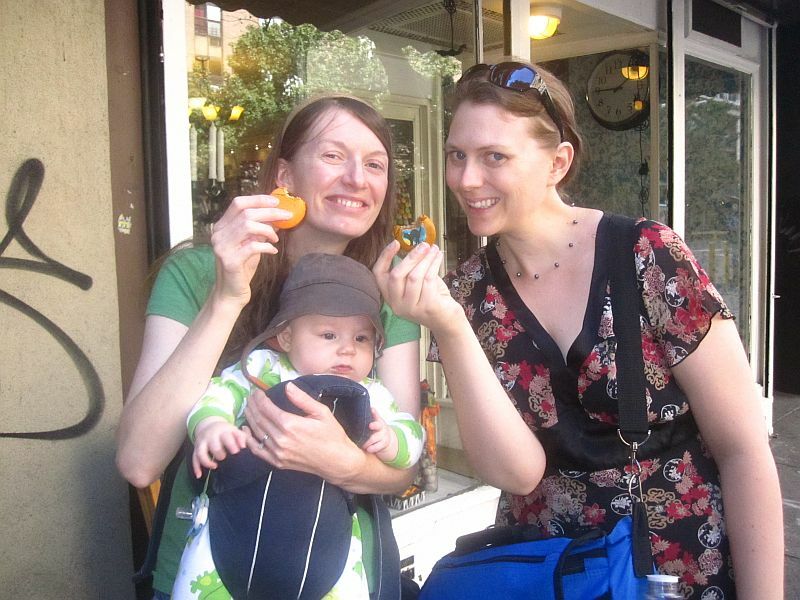 We met each other’s babies, held them and wiped their noses, drank coffee and wine and maybe even a little bit of vodka, took turns watching busy boys so child-free shopping could occur….laughed, cried, and I, for one, did a number of happy food dances. All as it should be. New York, New York — the city where all is possible. Stephanie, Alicia, and I met while working/living in Malawi. One of those things that feels like another life and yesterday at the same time. Now, between us we have 4 kids that were born in 3 different countries. I might even venture to say we represent the very different paths educated women can take during their child-bearing years. Before, our common ground was a shared faith in a dusty, colorful, land of hope and heartbreak. I don’t know fully what all of our experiences in Malawi were preparing us for, but it has just occurred to me that the stretching of our hearts in southern Africa made a whole lot of room for our growing families to fit in. Now, in addition to an affinity for good food and bright colors, our common ground has something to do with the joy and frustration of raising little boys; and the love-shiny faces that we each wore when talking about them and their daddies. 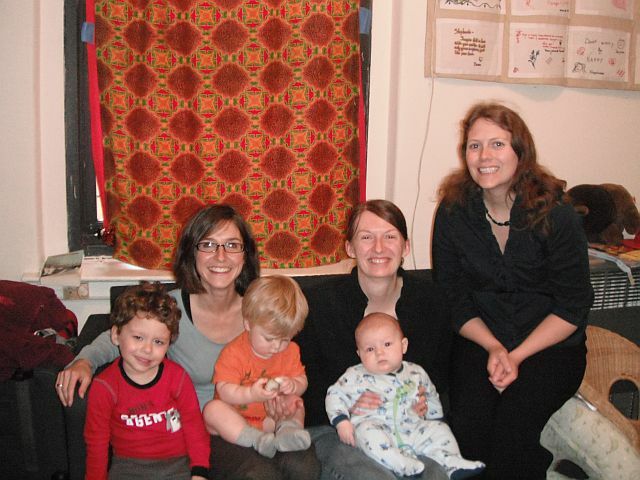 Given we were 4 adults and 3 kids (ages 4 months, 14 months, and almost 3) sharing an apartment when the numbers were at their lowest — 6 adults and 3 kids at their highest — the kid craziness I imagined didn’t ever really happen (or have I forgotten already?). 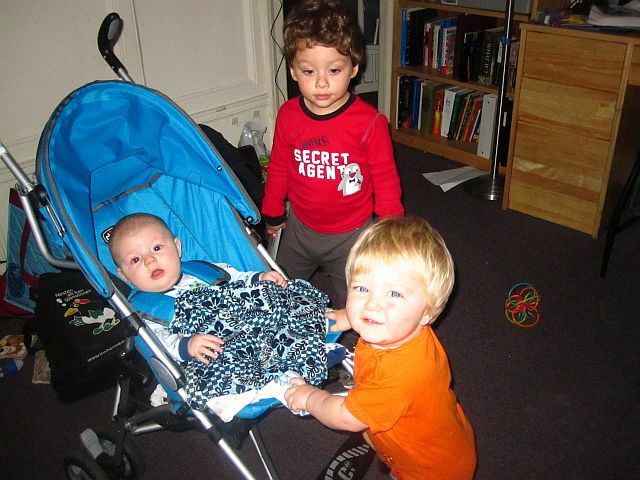 Aaron was fantastic about sharing his toys and letting Emil follow him around. Emil is used to big brothers, so is already trained to touch things gently then quickly look around to see what the repercussions might be. And Silas just cooed and laughed and charmed us all, bigger boys included. 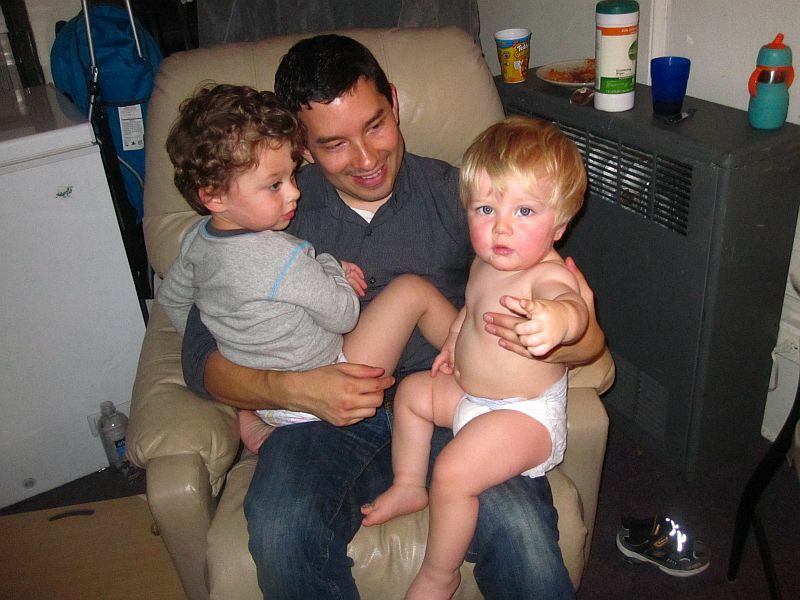 (Although Emil was going through a throwing phase while we were there, causing me to hover in protection over Silas’s little head whenever E came over to ”chat”). Alicia is my new baby-bjørn wearing hero — I attribute your past as a swimmer to developing your shoulder and upper back muscles in preparation for baby wearing. This was my first time in New York City. Impressions? Everything smelled SO GOOD! Dozens of different food smells within as many or less blocks. Bliss to my nose. 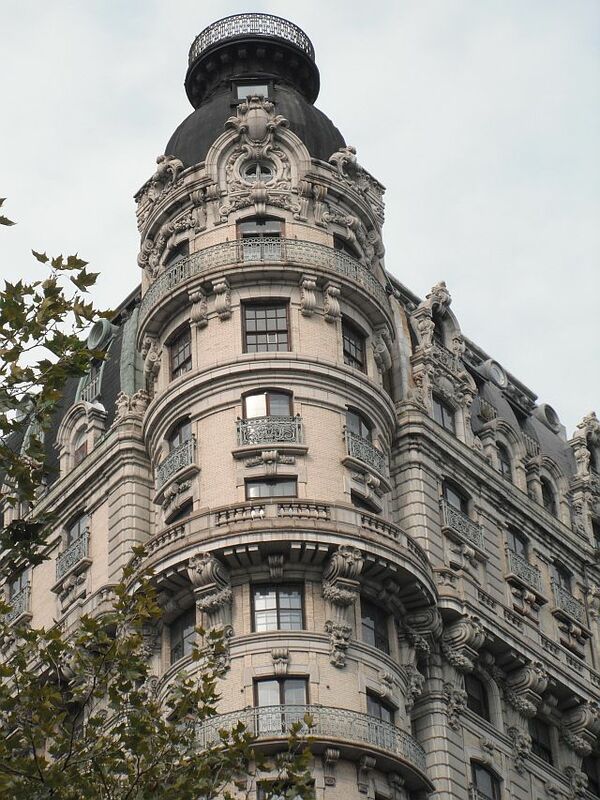 And the buildings — It reminded me a bit of the first few times I went to the ocean. After seeing it, you understand why people who grew up near it couldn’t ever really leave. The sheer size of the buildings, let alone their architectural beauty, gave you the sense you were walking along doing your normal tasks in the midst of grandeur. Is this post getting to be a bit country-mouse-in-the-city? Kinda how it felt. Just two more things: 1) People were so nice. 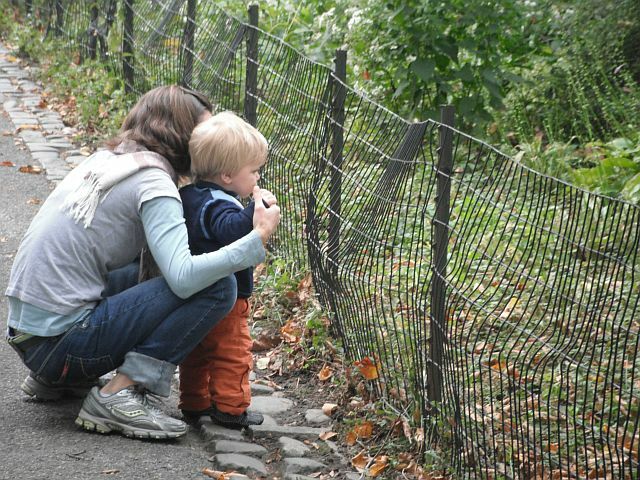 We were travelling along in a group of strollers and babies and obvious tourists, and people were so. nice. All the time. Smiled at the kids, gave up train seats, opened doors. A stark contrast to my later experience at the airport in which I, carrying two bags and with a toddler tied to me, was instructed I should carry my stroller down the stairs for it to be taken to the plane. For any that doubt the strength of mothers… Also a bit of a contrast to the culture here in the land of winter, where people are very, very kind and compassionate, but a bit more…stoic, shall we say?, when it comes to general passing-on-the-street-stranger friendliness. What else can you do when you randomly walk past a shop selling only macaroons? Buy them and eat them. I was rendered speechless by their goodness. 2) The best part about being in the U.S., besides seeing friends and family? Speaking English. I mean, I speak english all the time here, too. But I at least try Norwegian when we’re out and about. It took me a few common interactions to get over that feeling of guilt about speaking english, as I reminded myself that this was actually the language I am supposed to be using. Sweet liguistical freedom. I asked questions of store staff just for the sake of it. Looking stupid in one’s own language somehow feels a lot better. So there we have it. A million thanks to Stephanie, Joaquin, and Aaron for their incredible hospitality; to Alicia and Silas for making the trip; to Mom, Mandy, and Michael for always being willing to meet me wherever in the world/country I am. Love to all!